Deluge, in the English language: a severe flood. 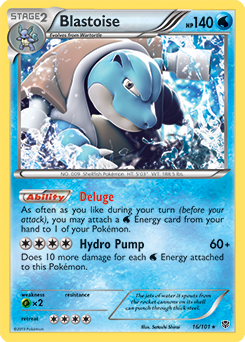 Deluge, in the Pokemon Trading Card Game: As often as you like during your turn (before your attack), you may attach a Water Energy card from your hand to one of your Pokemon. Blastoise was dominant for a while, but forces like Ghetsis and Hex Maniac ran rampant and kept it out of contention. Its significant finishes last season under the oppression of these two cards came in the hands of Cody Graham at Texas Regionals and Manuel Jorach at Florida Regionals, finishing thirty-sixth and sixty-first, respectively. A Top 64 finish is nothing to scoff at, but the problem is that the deck did not produce consistent results. How could it with problematic cards in Expanded format circulation? 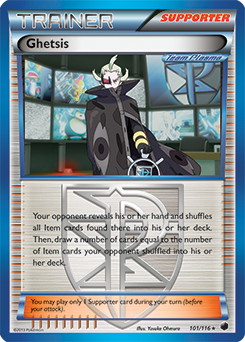 Ghetsis crushed the deck before you could play a turn, and Hex Maniac could lock a win up by shutting off the Ability of Blastoise and forcing you to manually attach your Energy instead. With Ghetsis and Hex Maniac banned, this deck is back on the radar and touting a powerful array of attackers with a unique purpose. I’m excited to talk about Blastoise, as it’s one of my favorite cards of all time, and a favorite deck. This will be fun! The main focus of any Blastoise deck should be pulling off the Archie's Ace in the Hole play on your first turn as often as possible. One of the great breakthroughs for this deck is that it has more Item-based draw effects than ever before in the form of Mysterious Treasure and Order Pad. The first turn Archie’s Ace in the Hole happens at least 75% percent of the time based on my anecdotal experience with this new list. Try your hand at the deck. This deck has many ways to play a hand down; the Blastoise play is inevitable. If you were to play one and prize it, you’d lose. Two is a check measure to avoid that, and there are some games where getting out two Blastoise is necessary in case your opponent targets one down. It’s the centerpiece of the deck. Without it, it would be a bunch of clunky Water Pokemon with no hope of ever attacking because they take so many Energy to use. Having several ways to find Archie’s Ace in the Hole is a necessity. Mysterious Treasure paves a path to find Tapu Lele-GX. This is a deck where avoiding bad Prizes is essential, so playing two of your “ways to get Blastoise” is important. It can serve as a decent attacker since you can overload it with Energy cards and Energy Drive for lots of damage. With so many cards in this deck requiring the discard of two cards, Exeggcute and its Propogation Ability is the perfect way to play these cards at “no cost”. When your deck relies on putting your hand size to a lone Archie’s Ace in the Hole, you will sometimes need to be able to play cards that you otherwise wouldn’t be able to like multiple Ultra Ball, Computer Search, Superior Energy Retrieval and Mysterious Treasure. In the past most of these lists played two Shaymin-EX. I’ve found one to be fine with so many new Item cards that can set up the Archie’s Ace in the Hole play, and Oranguru is a nice non-EX/GX substitute that you can also use multiple times while it’s chilling on the Bench. Like Shaymin-EX, as a support Pokemon it’s there to draw you cards. Psychic can be okay against these non-EX/GX decks like Night March. Since this deck can play its hand down so easily, Instruct can be powerful in the late game to defend yourself against N.